There have been two pig transport crashes this month. One in Burlington, Canada and one in Arizona, USA. The first crash happened on the 5th of October and the second one occurred earlier this week in Arizona. Okay, so two trucks bound for slaughter crashed, some pigs were killed and the ones that weren't were taken to slaughter. What's the big deal? The big deal is that some of these pigs could have had a second chance at life. 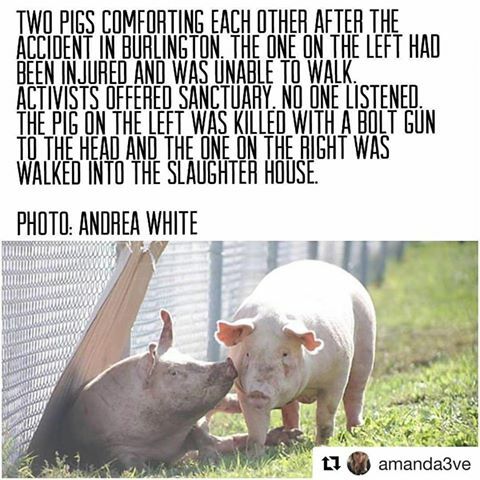 Shortly after the crash in Canada several animal activists gathered on the scene, including one of the parents of Esther The Wonder Pig. 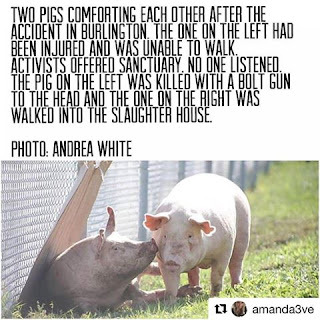 While forty of the one hundred pigs were killed in the crash, there were some that were injured, but due to the nature of their injuries, they were not fit for meat consumption. These pigs were lying a few hundred feet from the truck and while they were not able to walk, they were very much alive and conscious. One of Esther's parents was generous enough to ask if he could take them to a sanctuary, because while these animals were not able to be consumed for meat and were injured, their injuries could have healed and they could have lived out their days in peace. The request that they be taken to a sanctuary was completely ignored. And on that beautiful sunny day, these pigs who were injured, lying on the grass, were killed by a bolt gun to the head. These injured pigs could have had a second chance at life. They could have lived out their days surrounded by love. Instead, this simple and generous request was ignored and they were killed. It wasn't painless, pretty, or quick. These pigs seized and seized, convulsed and convulsed, until they became unconscious and their hearts stopped. Once they were dead, they were picked up by forklifts and taken to be dumped, and disposed of. Of course the workers couldn't do this in plain view because it would have upset the public. The workers, who were on the scene of the crash, held up large pieces of cardboard and tarps to cover up and conceal what was going on. Because if the public had really seen what was going on, they would have been appalled and saddened. This crash was traumatizing for these pigs. After already having gone through the crash, they were then hoarded out of the tipped vehicle with what looked like giant fly swatters. Although there were people trying to cover up what was occurring at the scene, there are videos where you can hear the panicked screams of the pigs. You can just sense their distress and fear. I don't know why these workers and officers couldn't have just let the few pigs go with Esther's parents to a sanctuary. It makes me sad that these injured pigs could have had a second chance at life, but because they were "defective" they were treated just like any other object. Their lives were ended and they were just thrown away. These kinds of atrocities don't have to continue. Please just leave meat off your plate. Open your eyes to see that these animals deserve love and respect just like your dogs and cats. Thank you to the parents of Esther The Wonder Pig for attempting to give these few pigs a second chance at life. I met you at Smithfield in August, maybe? I would like to take a Bible Study class if you offer one. I'm sure we would have others interested...please see FB page Vegans of Hampton Roads and also Jesus People for Animals. I love the sharing of vegan food...great idea and great job, Joy! Thank you both for all you do!